(Newser) – The Taliban were just as confused by Bowe Bergdahl as the Afghan villagers who first encountered him after he allegedly wandered off his base, two former commanders say. 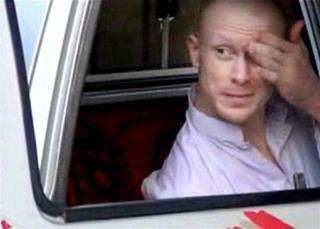 Fighters rushed to capture Bergdahl after villagers informed them of his presence, and he was found walking alone, acting strangely, and cursing his fellow Americans, one commander tells NBC. He said "he wasn’t happy with his countrymen, but he didn’t intend to convert to Islam" or become a jihadi, the commander says. Both say that they at first believed it was some kind of trick, and they wondered how and why he had left the base alone—which he may have done more than once. They say he described his departure as a "personal issue." The 0bama administration has as different story explaining Bergdahl's disappearance and capture. Who do you think is more likely to be telling the truth, 0bama or the Taliban?? Now if you were about to be captured by the Taliban, and you wanted to survive, don't you think Bergdahl's muttering a would be a decent strategy? Since he's still breathing, I'd say it was a good strategy. Of course it would have been a whole lot better strategy not to desert in the first place.